In September, 2018, Scott Lobdell, Dexter Soy, Alisson Borges, and Veronica Gandini, each decided to do something very-very nasty to the company who've employed them, DC Comics, which involved a fish, a tube of mustard, and the wrong side of an umbrella. 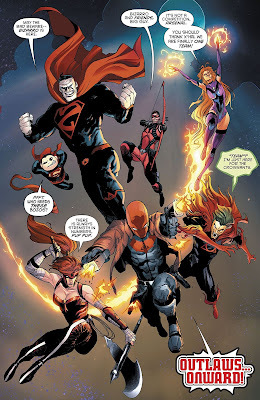 Now for further information please check out my following review of Red Hood and the Outlaws. Please enjoy, but mind the mess. TO QUOTE Lauren Oliver: 'Anger is useful only to a certain point. After that, it becomes rage, and rage will make you careless'. It’s happened. It’s finally happened. Jason Todd has finally allowed his anger to get the better of him and now he’s committed the cardinal sin. He’s taken the life of a known villain, The Penguin, and he’s currently going on a mad rampage without a care in the world. Plus, to make matters even worse, Bizarro has lost his heightened-intelligence and isn’t able to stop an impending doom that’s looming over the city. First and foremost, I’d have to say that the entire issue was an obvious means to an end. Meaning, that it took our three main characters, Jay, Bizarro, and Artemis, and used them to carry out some questionable actions that don’t seem to fit too well with their personalities. 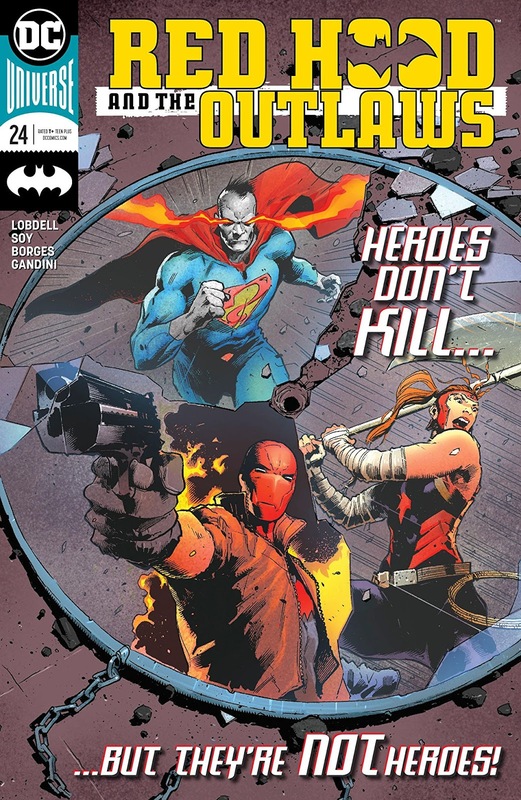 I don’t blame Scott Lobdell though, the writer assigned to write this book, because ultimately the direction of this series is being spearheaded by DC’s editorial team, so all Lobdell can really do is try his best with what he has available. That said, however, in the same breath, I’m afraid to say that this ‘strange new direction’ has one fundamental flaw. 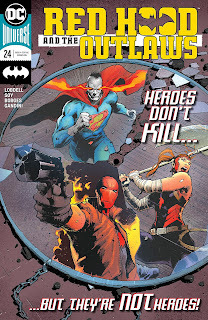 It’s cutting short most of Lobdell’s previously planned plot-lines, and will basically discard most of what he has built up over the past 12 months. Well, let’s face it! What’s going to happen to his Ma Gunn storyline, for instance? Or any of that other stuff revolving around Artemis and Jay? Also, let’s not forget about Bizarro? Will DC temporarily stick him on the shelf for the time being, and if they do, will they bring him back once everything is done and dusted? I hope so, I sincerely do, but then again, that’s the problem when a series takes a sudden departure from what we’re used to seeing. We start to doubt the validity of certain peoples creative pursuits and hope things will pan out in the long run. What do you think, dear reader? Let me know your thoughts in the comment section below, as I’m always interested to read what you have to say. But before you go off and do that, in the meantime I best talk about the artwork featured in this book. It was provided by Dexter Soy and Alisson Borges (with Veronica Gandini handling the coloring duty’s), and like always, every single one of them did a splendid job with their particular portion of the plot. Soy’s work continues to be of a very high standard because his characters are constantly expressive and his action scenes are very fluid by design. Whereas Borges, on the other hand, seems to have his own approach when it comes down to depicting these heroes. Rather than following Soy’s lead, his style of illustration is a lot more cartoonish in comparison; and occasionally borders on being very-very Manga. Not that this is a bad thing, mind you, because, while different, it’s still pleasant to the eye and fits the tone of the story fairly well. And as for Gandini? My God! What can I say about our colorful queen of the RGB? Once again she keeps the ambient tone of this book consistent by homogenizing both styles to appear seemingly as one, proving, as always, that RHATO has one of the best art teams in the business. In very simple terms, Jason’s current action's have set him on a path of self-destruction that will alienate him from his family and friends, all because he let himself get blinded by his own aggression. So with that said, I found Ozzy Osbourne’s “Suicide Solution” to be a perfect song for this story. Rock on!!!! 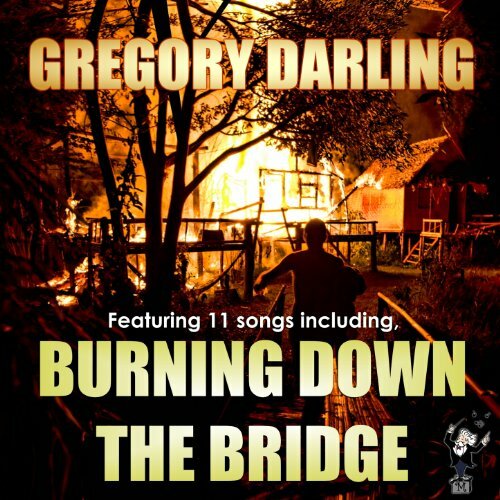 From the looks of it, Jason is more than willing to burn down the bridges which he has constructed over the past few years, doing so in a fit of rage that we can only hope will be resolved sooner or later. 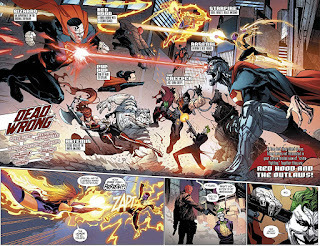 Even though it fell fairly short of reaching the usual high standards set by Scott Lobdell in the past, the story in itself is a perfect one to read if you want to know what's going on with Jason’s new direction. Apart from that though, well, just like my review, this episode is blunt and straight to the point, plain and simple, and doesn't seem too bothered by other peoples hopes and dreams for this title. For now, anyway.